These little beauties are so simple to make but SO delicious and they make a perfect gift too if you don't eat them all yourself first! Place the chocolate and coconut cream in a pan and melt gently over low heat. When stirred it will come together and be thick, creamy and luscious. 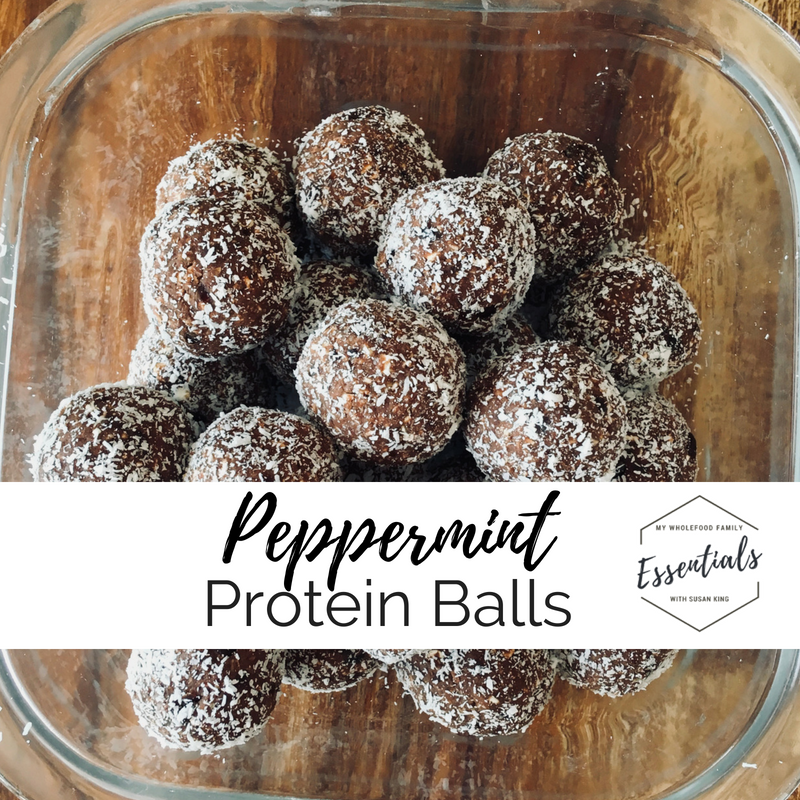 Divide mixture into 3 bowls, add the essential oils and mix-ins then leave in the fridge for around 4 hours to set before rolling into balls. Add 1/2 cup finely chopped dried cranberries and 5 drops doTERRA Wild Orange essential oil. Once set, roll in cocoa powder and store in the fridge. Add 2 drops doTERRA Lime essential oil and 2 drops doTERRA Black Pepper essential oil. Once set, roll in toasted coconut and store in the fridge. Add 2 drops doTERRA Cardamom essential oil and 2 drops doTERRA Ginger essential oil. Once set, roll in crushed pistachios and store in the fridge. 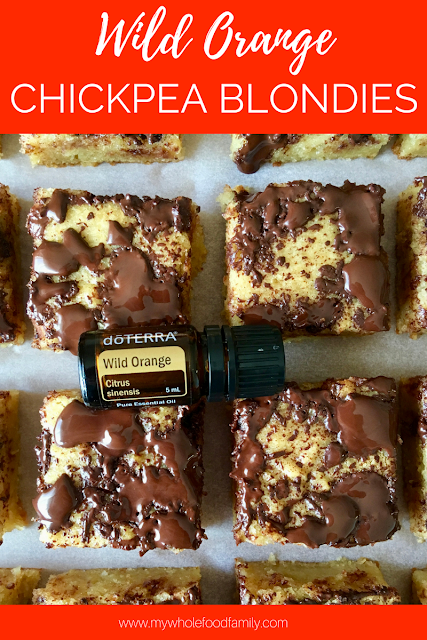 If you haven't experimented with essential oils to flavour your food yet, you're missing out! Just a couple of drops adds amazing flavour and can transform any dish into something extraordinary. These truffles make the perfect gift. If you don't eat them all yourself! Which flavour combo do you like the sound of? I only use and recommend doTERRA essential oils. See why here! 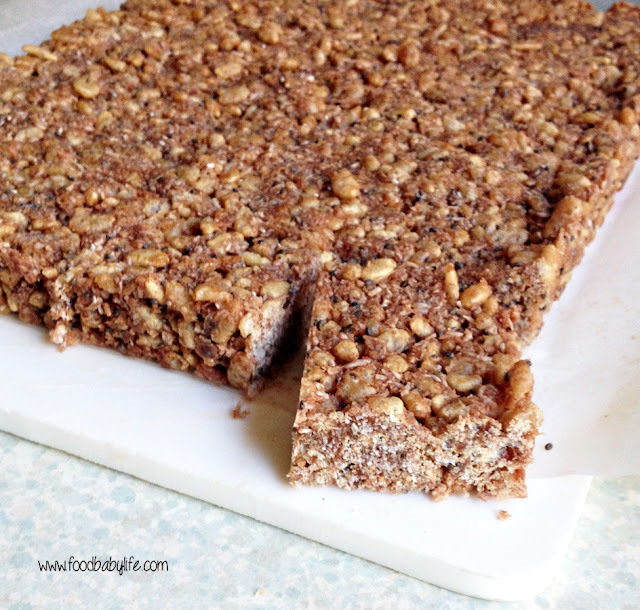 Do you need nut-free snacks for school or kindy? But still want something that will fill them up? We do. And it means we need to get creative because at home we use nuts and nut butter in practically everything! These bliss balls are packed with fibre and protein and my 4yo LOVES them. They are the perfect high energy snack for a big kindy kid. Just don't mention the chickpeas! Add all ingredient to your food processor or Thermomix and blitz until the mixture clumps together (about 10 secs / SP 8). Roll spoonfuls into balls and roll in desiccated coconut. Makes approx 18 depending on how big you make them. Yesterday was the Winter Solstice which means we're now calling in longer days and more sunshine. Until that happens though, one good thing about this cold weather is that it's always time for hot chocolate around here! 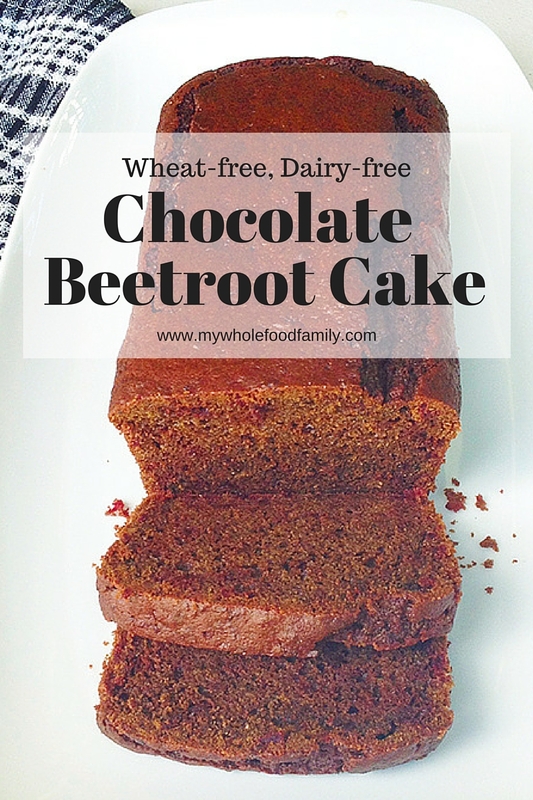 This is a really hearty and nourishing version and my kids and I love it! The addition of the gelatin makes it a bit foamy, almost like there are melted marshmallows in it! Place all ingredients except the oils in a pan over medium heat and whisk until warm and well combined OR place in Thermomix and cook 5 mins / 70 degrees / SP4. Add the oils and mix again for a few seconds at SP 9 before serving. So who wants hot chocolate now? I was searching for the perfect guilt-free treat for Mother's Day and came up with these! If you're a fan of the combo of chocolate and orange you will love them. And even better, they're free from gluten, dairy, nuts and refined sugar! I've since made another 2 batches of these and both times left the chocolate off the top. This makes them less rich and the ideal treat for my kids' lunchboxes. They have no idea it's healthy and the chickpeas give them a hit of protein as well. Preheat oven to 180 degrees C. Line an 8-inch square baking pan with paper and set aside. In a food processor or Thermomix, beat together the chickpeas, eggs, syrup and coconut oil until smooth (30 seconds / SP 7). Add remaining ingredients (except for chocolate) and mix until just combined (10 seconds / SP 4). Scrape down the bowl as needed. Pour batter into prepared tin. 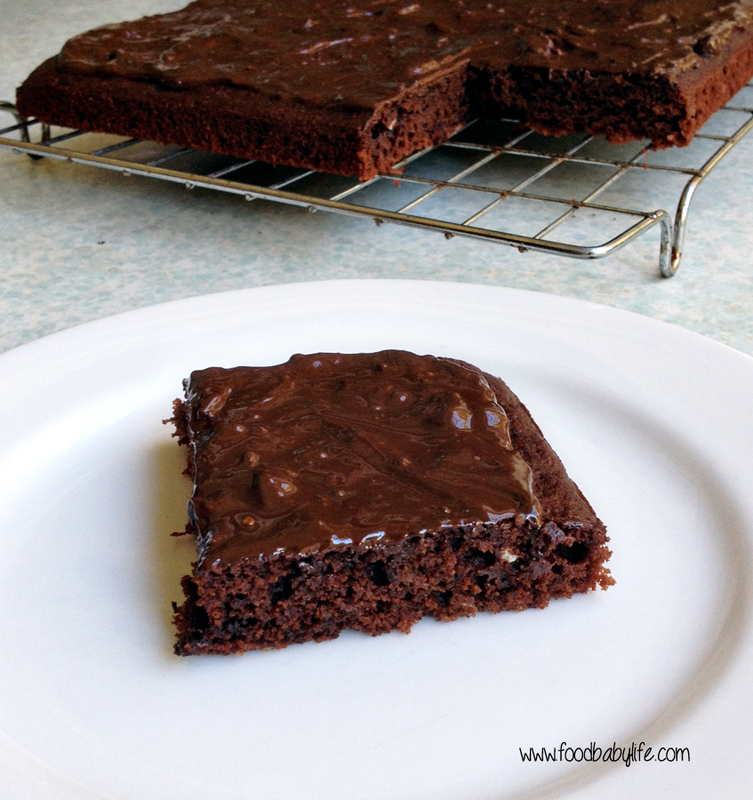 Sprinkle over chopped chocolate and bake for 25 minutes or until a toothpick comes out clean. Cool in the tin before slicing into 16 pieces. Leave the chocolate off and they make the perfect lunchbox treat too. At our place the 1st of December is all about Christmas - the tree goes up, the Christmas music goes on and we start our nightly tradition of reading a different Christmas book each night with the kids. Love it! On Facebook, I'm starting a 12 days of DIY Christmas gifts series today with a selection of recipes using our beautiful essential oils. Hop on over and like My Wholefood Family Essentials to get inspired and play along! One of my favourite ways to use my oils is to flavour my food, especially anything chocolate. So given my chai obsession at the moment I've adapted my basic raw chocolate recipe and made this amazing chai chocolate with cashews! 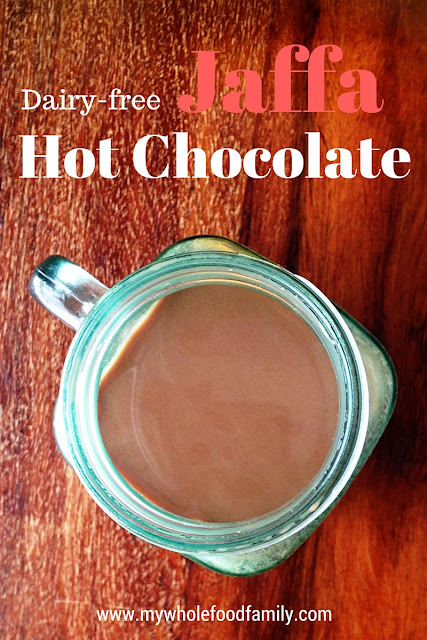 If you like the warm, sweet spiciness of chai you will LOVE this chocolate. These spice oils are warming for our bodies, can aid digestion and are packed with antioxidants. And of course it tastes AMAZING! Place the coconut oil, cacao powder, salt and maple syrup in a small pan over low heat and stir until smooth and well combined. Remove from the heat and add the cashews and essential oils. Mix well and pour the mixture into a lined 20cm baking pan or a silicone cake pan and place in the freezer to set. Once firm (it doesn't take long at all), break into pieces and store in an airtight container in the freezer. As this chocolate contains coconut oil it will melt if left at room temperature. You can see in the photo that it was already starting to melt! I only use and trust doTERRA essential oils to use at home and in our food. 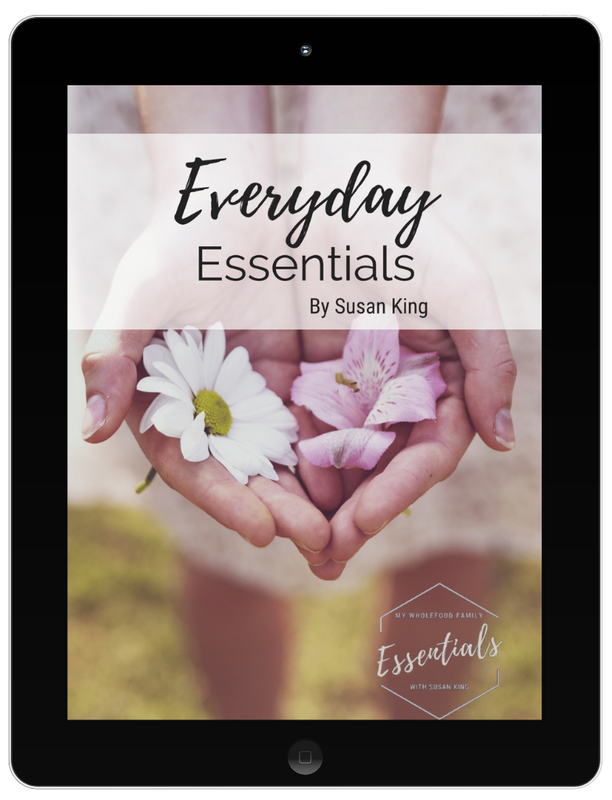 To get your hands on some please leave me a comment below or read this post on how to get started with essential oils! Have you made your own chocolate yet? If you have, you'll know it's both a good and bad thing. Good because it's so easy and so delicious. Bad because is so easy and so delicious! 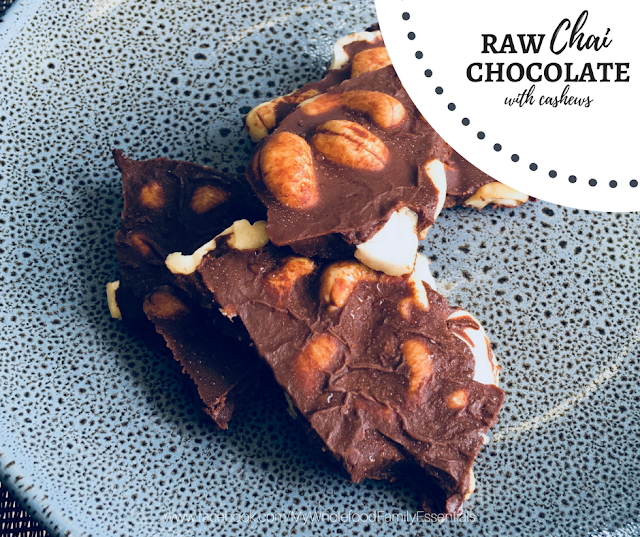 We LOVE raw chocolate at our place and I love experimenting with different flavour combinations! The base recipe is always the same - cacao, coconut oil and whatever sweetener you like. I generally use rice malt syrup because it's fructose free, not too sweet and it has a very neutral flavour. 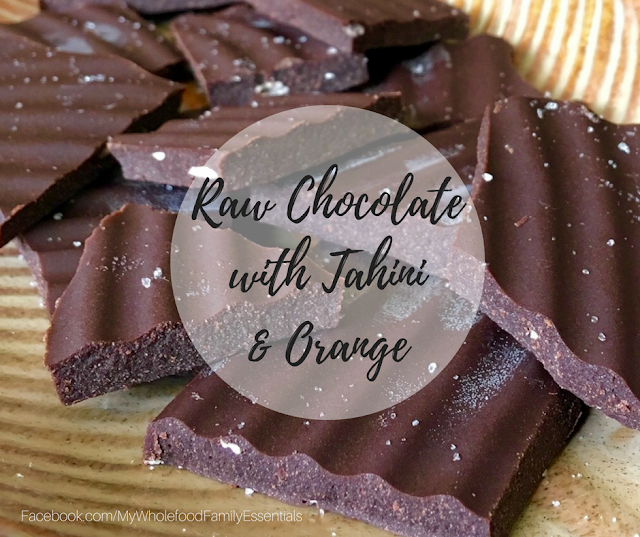 This combination of tahini and wild orange is my new favourite and it's been a hit with the kids too (even though tahini is a bit of an acquired taste). So why use tahini? So many reasons not the least of which is, it's delicious! Tahini is sesame seed paste and a great alternative to nut spreads like peanut butter if you have allergies. It's really high in good fats, amino acids, vitamins and minerals and has been shown to be beneficial for heart health, helpful for balancing hormones and improving nutrient absorption (https://draxe.com/tahini/). It also pairs beautifully with both chocolate and orange! Place all ingredients in a small pot over. Place over very low heat, just to melt the coconut oil, and stir together until smooth. Pour into a lined slice pan or silicone baking pan. Store in the freezer and break into pieces to serve. As much as I enjoy cooking, one of the best bits about Mother's Day at our place is that I don't have to cook! Bliss! I always get something yummy for breakfast with a cup of tea and then a special dinner and dessert made by my hubby with the help of the kids. If your family needs a hint as to what you'd like for your Mother's Day dessert then I have the perfect recipe for you. This chocolate cheesecake was luscious, creamy and just plain delicious. 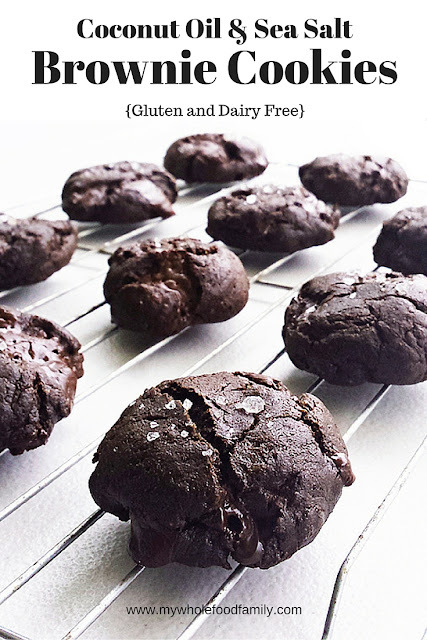 It is free from both gluten and dairy and no baking required so it's a great one to get the kids involved with. I actually made this last month for Easter Sunday but I think it would be just as perfect for Mother's Day! You could also make some fun variations with the flavours. Make sure you give it a solid 30 minutes out of the freezer before serving, otherwise it will crack a little like you can see in the photo above. Another 10 minutes and it would have been luscious, creamy perfection as it was in my bowl when I was eating it! Oh and remember you will need to start this the day before so the cashews can soak overnight! You can cover them with boiling water for an hour or so if you get absolutely stuck but the end result won't be quite as smooth and creamy. Grease a 20cm springform pan and line the base with baking paper. To make the base, place all ingredients into food processor or Thermomix and process until the mixture sticks together. Press into the base of the prepared pan. Scatter over 1/2 cup of the berries and place in the freeezer while you prepare the filling. 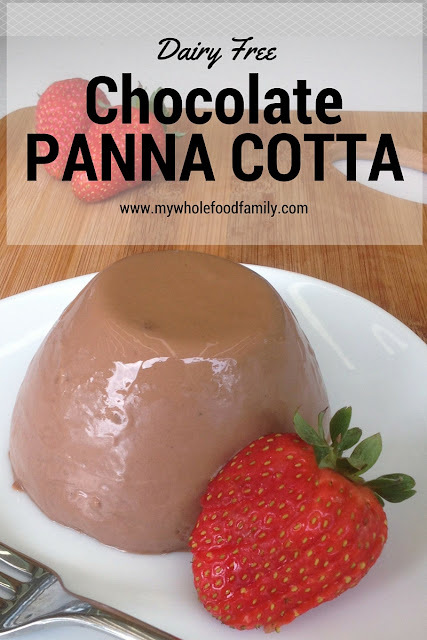 To make the filling, place all ingredients into same food processor or Thermomix bowl (no need to wash it) and process for 2 minutes until completely smooth and creamy. Scrape down the sides halfway through. Pour the mixture over the berries on the base and place back in the freezer until ready to serve. To make the berry sauce, just before serving place the remaining 1 cup of berries and extra honey into a bowl (and orange oil if you are using it) and smash with a fork until you have a chunky sauce. Remove the cheesecake from the freezer 30 minutes before serving. Top each serve with berry sauce. Enjoy! Do you have any special Mother's Day traditions or recipes at your place? And just like that it's Secret Recipe Club time again! Each month members are assigned a blog in secret to peruse and choose a recipe from, then we all reveal our posts at the same time. It's a lot of fun and I always look forward to reveal day. Anyway, being temporarily gluten-free meant I had to look more closely at the recipes on my chosen blog for the month, which is Our Table for Seven by Erin. As you can tell by the name of her blog, Erin has a lot of mouths to feed! Erin says she only really got into cooking and baking when her eldest son developed some picky eating habits and she wanted to make the foods he would eat a bit healthier. Erin, I hear you! I have the same issues with my Mr 5. 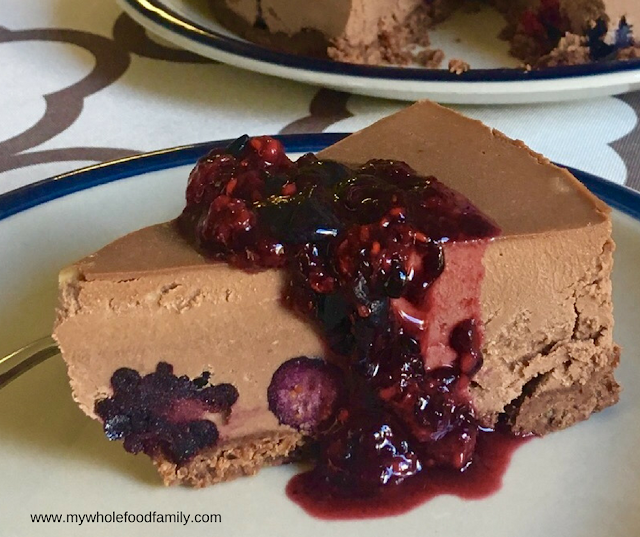 I decided I wanted something sweet and simple this month and found loads of recipes to choose from that I could easily adapt to gluten and dairy free. Like this Flourless Chocolate Cake that looks so rich and decadent, these Walnut and Maple Syrup muffins and this Simple Homemade Caramel Corn which I am planning on taking to a Christmas in July party next weekend! 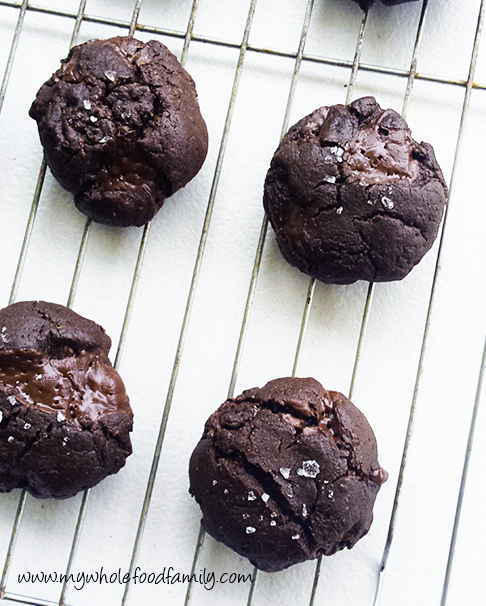 But when I saw these Coconut Oil and Sea Salt Brownie Cookies the search was over. We love our coconut oil in this house (in fact we love it so much I buy it in huge 5kg tubs!). It tastes amazing and it's a brilliant substitute for butter in baking. So these cookies were in a word, AMAZING. The mixture was so rich and chocolatey and I couldn't stop sneaking little tastes as it rested in the fridge. Once they came out of the oven my boys were hovering and couldn't wait to try them. They were fascinated by the salt on top (which according to Heston Blumenthal helps balance out the bitterness in dark chocolate in case you were wondering). I made very minor changes to the recipe, swapping out the flour for gluten free varieties, reducing the sugar slightly and using chopped dark chocolate instead of chocolate chips. 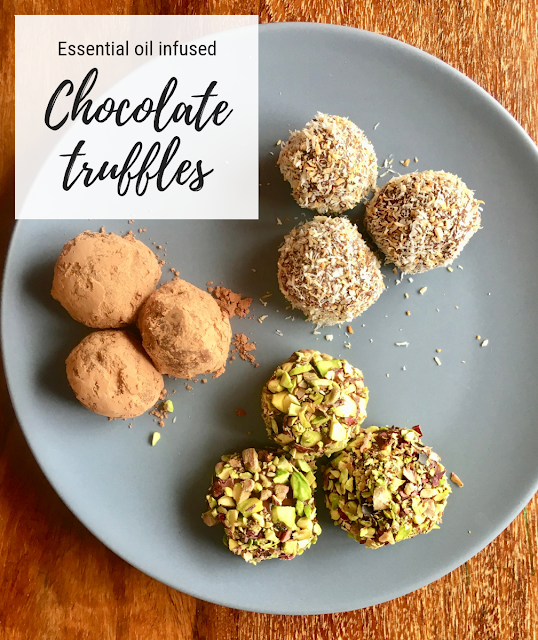 I've only included the Thermomix instructions here but it can easily be converted to stove top (you really just need to melt the coconut oil in a saucepan then mix everything else together) or just check the original recipe for Erin's instructions. Preheat oven to 180 degrees Celsius. Line 2 baking trays with baking paper and set aside. Melt the coconut oil (TMX 2 minutes / 50 degrees / SP 2). Add the coconut sugar and beat for 20 seconds / SP 4. Add the eggs and vanilla and beat again for 20 seconds / SP 4. Mix the bicarb soda and hot water together and add to the mixture (4 secs / SP ). In a small bowl whisk together the flours, cacao and salt. Add to the egg mixture and mix for 10 seconds / SP 4. Add the chopped chocolate and mix for 6 secs / REVERSE / SP 3. Place the bowl into the fridge for 15 minutes to allow the mixture to firm up. Roll spoonfuls of mixture into balls and place on the prepared trays. Flatten the tops very slightly then sprinkle with extra salt. Leave on the trays to cool for 5 minutes before carefully placing them on a wire rack to cool completely. We're coming to the end of 2 weeks school holidays here and while I've been baking up a storm I've taken a bit of a break from blogging. I do have a slew of awesome recipes lined up for the next few weeks though! Having all 3 of my boys for 2 weeks has been wonderful and they've been very willing guinea pigs for my baking experiments. Some hits, some misses ... but they've devoured the lot! This recipe was an unexpected hit with my boys - they LOVED it! I had a couple of beetroots leftover at the end of the week and rather than make juice or a beetroot dip as I normally would I decided to make something sweet. As you know I love boosting the nutrition of my baked goods by using spelt instead of wheat, adding nuts and seeds and of course, adding vegetables. Carrot, pumpkin, sweet potato and zucchini all work brilliantly. 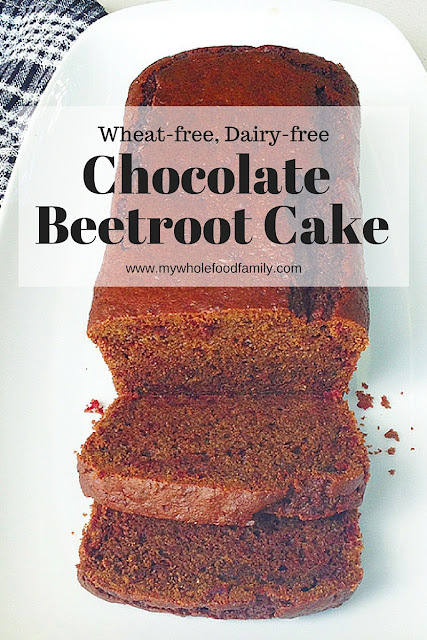 I wondered if the earthy flavour of the beetroot would be too much for the kids but I needn't have worried, they just saw it as a chocolate cake and each had seconds, and then thirds! 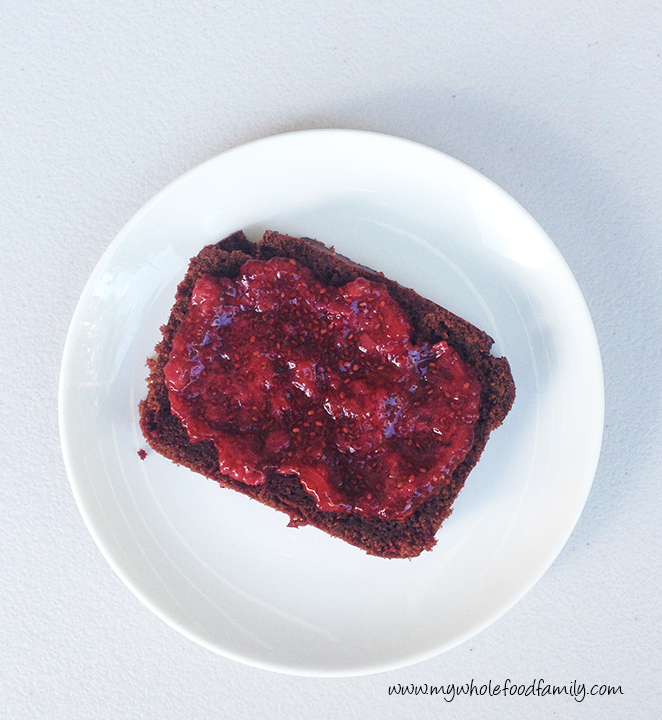 The boys had theirs with butter and then the next day I had a piece toasted and topped with my homemade roasted strawberry chia jam. SO delicious. 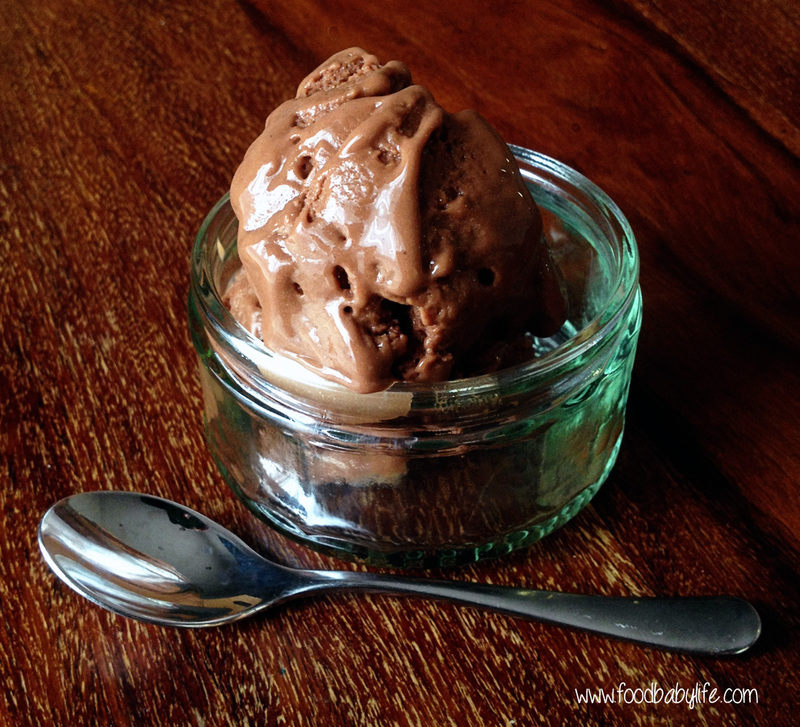 You can increase the chocolate flavour by replacing 1/4 cup of the white spelt flour with 1/4 cup raw cacao powder. Grease and line a loaf pan with baking paper and set aside. In a small pan, melt the coconut oil and chocolate together over low heat, stirring until it is smooth. Remove from the heat and allow to cool for a few minutes. Place the coconut sugar, flours, baking powder and salt in a large bowl and stir with a whisk until well mixed. Pour in the cooled chocolate mixture, grated beetroot and eggs, and fold together with a spatula until just combined. Thermomix - roughly chop the beetroot then grate for 4-5 seconds / SP 6. Tip out the beetroot into a small bowl and scrape down the sides well. Add the chocolate and chop for a few seconds / SP 6-7. Add the coconut oil and melt for 3 minutes / 37 degrees / SP 3. Add the coconut sugar, flours, baking powder and salt, followed by the beetroot and eggs. Mix for 10 seconds / REV / SP 3. Scrape down the sides and repeat if needed. Pour the mixture into the prepared pan and bake for approximately 50 minutes or until the top springs back when pressed and a skewer comes out clean. Leave in the tin to cool for at least 15 minutes before turning out onto a wire rack. Have you tried hiding vegetables in cakes and muffins? Do you have a favourite recipe you could share? I'm always looking for inspiration! I don't want to start by talking about the weather but boy has it been cold! Winter has well and truly arrived here finally and we've been enjoying being all rugged up with coats and scarves and eating lots of yummy warming soups and casseroles. We've also been having a lot of hot chocolate lately, and I've started experimenting with different combinations of milk to find just the right one. This is the best one yet! As a kid Jaffas were my favourite chocolate and I got a bag every time we went to the movies (I'm sure I must have been delightful after all that sugar!). 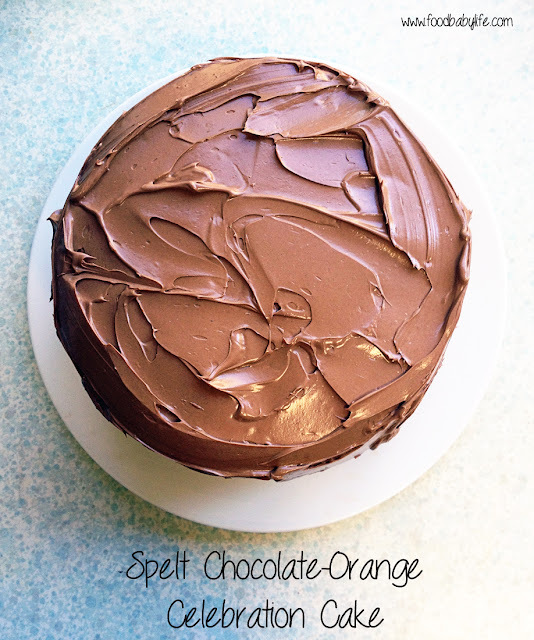 To me the combination of chocolate and orange is always a winner. In fact I made myself a Choc-Orange birthday cake last year, have you seen it? This jaffa hot chocolate is rich and creamy and oh so flavourful. My boys absolutely loved it and ask for it every morning. I can see this becoming a bit of a family tradition! Place all ingredients into the thermomix and heat for 6 minutes / 60 degrees / REV / SP 2. No thermomix? 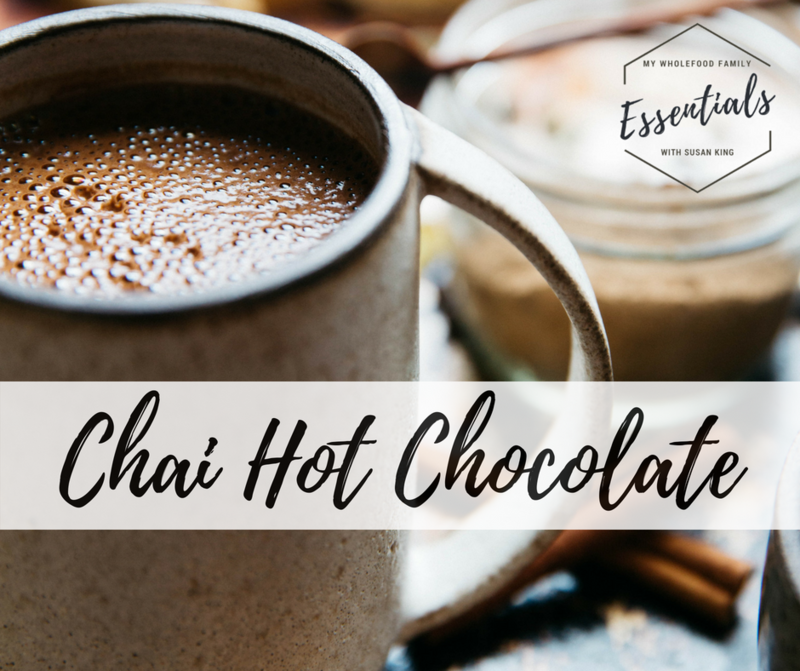 Just place all ingredients into a medium pot and stir over low-medium heat with a whisk, until the cacao and coconut sugar have dissolved and it is hot enough for you. Do you have a favourite Winter drink? I've been doing a lot of baking lately but it's been all muffins, bliss balls and breads. It seems like aaaages since I've made a proper dessert - something the kids get really excited over and that seems a bit special. As this is my first month with Group C in the Secret Recipe Club (after moving across from Group D) I thought I would celebrate and choose something sweet and out of the ordinary! This month I was assigned The Avid Appetite by Rachel who lives in Jersey City with her husband and gorgeous daughter Penelope (the cutest name ever). I loved spending time on Rachel's blog and apart from a love of food (obviously), found we have a quite lot in common such as loving overnight oats for breakfast to being a fan of both Castle and Gretchen Ruben! I was really spoilt for choice when it came to selecting a recipe and there were loads that I bookmarked for later. I love the sound of her Vanilla Cinnamon Quinoa for a protein-packed breakfast, I'm intrigued by the Pumpkin Butter and my boys would go crazy for these Banana Bars with Chocolate Frosting. 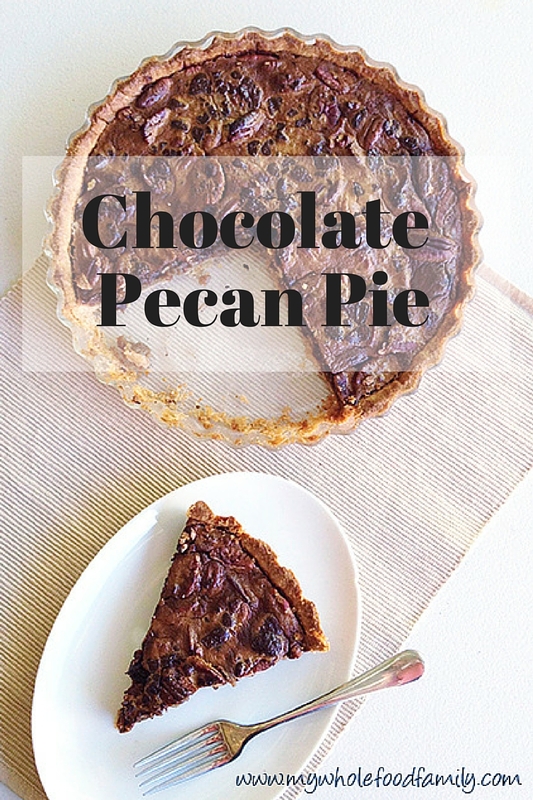 It was the Chocolate Pecan Pie adapted from a Paula Deen recipe that really caught my eye though (I have a bit of a soft spot for Paula Deen after reading her autobiography a few years ago). 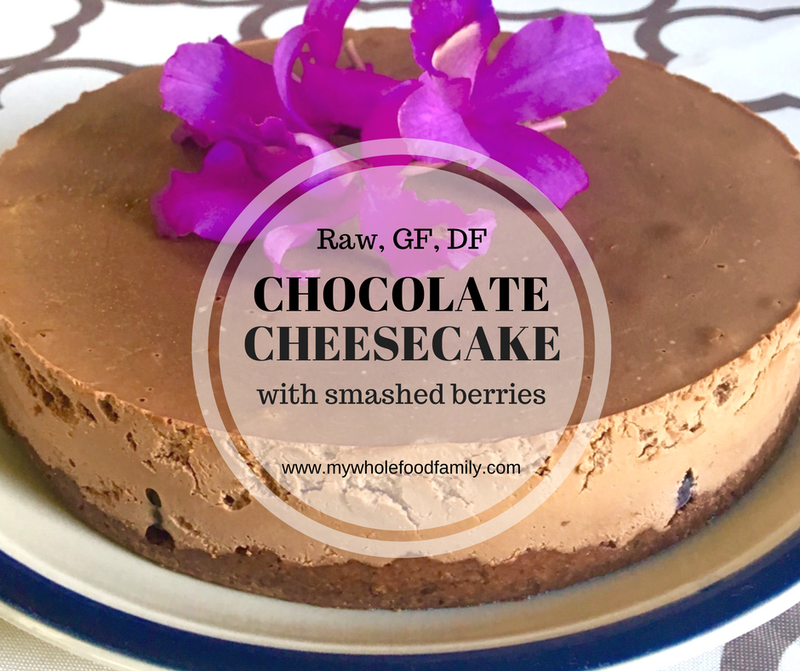 I was prepared to make a few changes in order to fit in with our wholefoods way of eating, and just a couple of simple switches later we had the most amazing, but not too sweet, dessert! We LOVED this. Perfectly short pastry, sweet nutty filling with little pops of dark chocolate. What's not to love? Try as I might though I couldn't get a clean slice. I mean, is there a trick to slicing a pecan pie neatly without all the nuts smooshing out the sides? Still the taste made up for the messiness. DELICIOUS! Place all ingredients except the water into a food processor and blitz until it forms breadcrumbs. Add the water a little at a time until the dough comes together and forms a ball. Wrap in plastic and place in the fridge to chill for 30 minutes. Roll out the dough in between 2 sheets of baking paper, large enough to fit a 22cm tart dish. Either wrap the remainder of the dough and place in the freezer for another time or roll it flat and cut out cookies to bake at the same time as the pie. My boys love this! Scatter pecans over the uncooked pastry shell. Place the eggs, butter, syrup, sugar and chocolate into a mixing bowl and whisk together until well combined. Pour the mixture over the pecans. Place the pie onto a baking sheet and cook for 10 minutes. Lower the temperature to 180 degrees and cook for a further 25 minutes or until set. Remove from the oven and place on a rack to cool completely. Thanks for a great recipe Rachel! My family loved it. I can't even believe it but my big boy turned 7 yesterday. 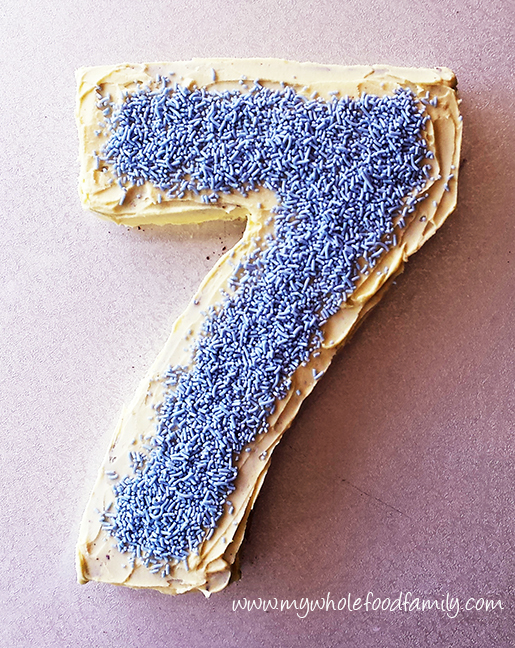 7! We couldn't be prouder of this kind, curious, funny boy with the infectious laugh and big heart. Love him to bits! No birthday party this year (we've decided to alternate birthday parties for the boys and he had one last year which I talked about here), instead he took some cupcakes to share with his classmates and we had family over for birthday cake and pizza - his choice. 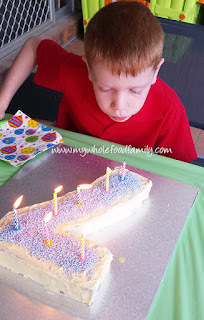 Being a wholefood and low sugar family birthdays always pose a dilemma for me. While we don't want to take an 'anything goes' approach, we also don't want to restrict treats when to me, having something once a year on your birthday is the very definition of a treat. So while these recipes definitely contain more sugar than is normal for us, they are also free from artificial additives and full of less-refined ingredients such as spelt flour, raw cacao, coconut sugar and grass-fed butter. And I'm totally ok with that. Mr 7 was very clear that he wanted mini chocolate cupcakes with chocolate icing for school, and chocolate number 7 cake with vanilla icing and sprinkles for home. Preheat oven to 150 degrees fan-forced / 170 degrees Celsius. Line 2 mini cupcake pans with 36 paper cupcake liners and set aside. Place all ingredients into a large bowl, in the order listed, and mix with electric beaters for about 1 minute until smooth and well combined. If you have a thermomix, place all ingredients into the mixing bowl and mix for 30 secs / SP 4, scraping down the sides as needed. Spoon heaped teaspoons of mixture into the prepared tins, filling each just over half full. Bake for 9-10 minutes or until the top springs back when pressed lightly. Do not overcook! Grind the coconut sugar first and then measure out 1 1/2 cups, reserving any extra for another time. Add the remaining ingredients and beat until smooth and fluffy. Pour 00s & 000s into a small bowl. Spread icing on the top of each cupcake then dip lightly into the sprinkles to decorate. I'm told the cupcakes went down very well at school! Next was his birthday cake for home. Now I've tried many recipes over the years and I knew that not all of them would work for a shaped cake like this one. I need something that wouldn't fall apart when it was sliced. Rather than reinvent the wheel I decided to tweak a few recipes I've made before and come up with my own. Preheat oven to 170 degrees Celsius / 150 degrees fan-forced. Grease a 23 x 33cm tin and line the base and sides with baking paper. Place all ingredients into a large bowl and using electric beaters, beat together at low speed until combined, then on high speed for 2 minutes until smooth and glossy. Pour the mixture into the prepared tin and bake for approx 50 minutes or until a skewer inserted into the middle comes out clean and the top springs back when lightly pressed. Cool in the tin for 5 minutes before turning out onto a wire rack to cool completely. Combine all ingredients in thermomix or large bowl with electric beaters and beat until smooth and pale. 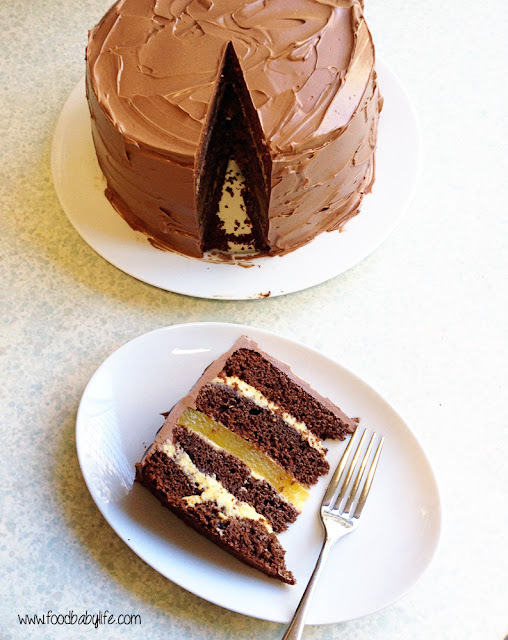 *I have experimented using all coconut sugar for the icing before and while the flavour was amazing it was quite caramel in colour which was not the look I wanted here. 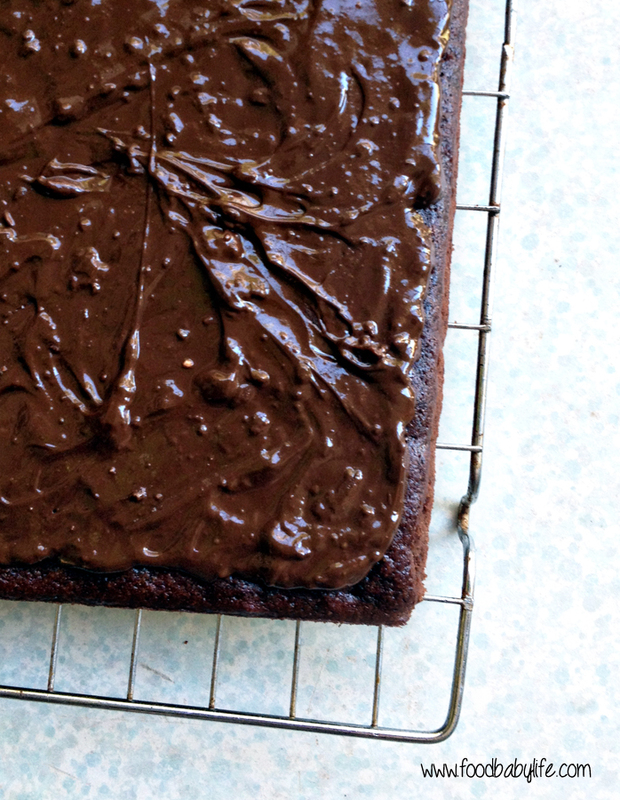 Next year I will be pushing harder for a chocolate icing so I can use all coconut sugar and some avocado as well. I used a template to cut out the number 7 shape and did a crumb coat and second coat of icing before decorating with Hopper's 00s and 000s which are free from artificial additives. So that's it. Our sweet but additive free birthday cakes for our sweet Mr 7. How do you handle birthday parties at your place? Do you have certain foods that you just won't serve or does anything go? Well I don't know where the last week has gone! The kids went back to school on Monday and we've been easing ourselves back into normal routine. Early starts in the morning, less time to cook, homework to do - I'm sure you all know about that! If you've been following me on Facebook you will have seen my whoops moment today. You see there was a blackout a few nights ago and the next morning our oven wouldn't turn on. Which is a pretty much a complete disaster for someone who bakes as often as I do! Anyway after stressing for a few days about whether we could replace it now or survive without one for a while, I realised I hadn't reset the clock on the oven after the blackout and as soon as I did, voila! It worked! Whew. Today though I'm sharing a recipe which doesn't require an oven and was so delicious my kids haven't stopped talking about it! While panna cotta is traditionally a dairy-laden dessert, this version gives you the same ultra creamy result with coconut cream. This is essentially the richest, creamiest most luscious custard you will ever eat, with the gelatine allowing it to set enough to be turned out while still having a bit of a wobble. Just gorgeous. Place all ingredients into the Thermomix and cook for 7.5 minutes / 80 degrees / SP 4. Pour mixture into 4 cups or ramekins and place in the fridge to chill for at least 4 hours or overnight. No thermomix? No worries. You can make this on the stove top by following the link above to the original method (I did make a few changes to the recipe). I actually can't remember the last time I baked anything with chocolate chips. Being dairy free my chocolate choices are quite limited and I tend to stick with blocks of 85% cocoa chocolate like Lindt or Green & Blacks which are naturally free of dairy. But when I spotted these dairy free chocolate chips in the bulk section of the my health food store I had to grab some and make something for the boys. 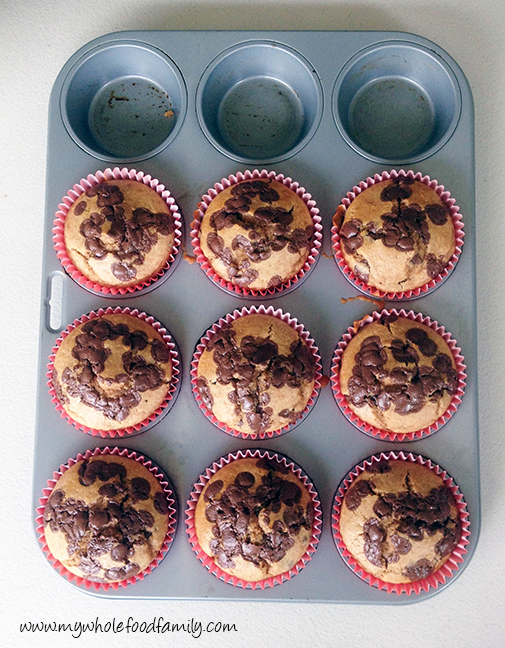 And what else to bake but chocolate chip muffins?! I got 10 from this recipe but you could easily make 12 instead (I normally would) just by making them slightly smaller. This is a simple and delicious recipe that is free from wheat, dairy, nuts and refined sugar. Perfect for the after school munchies! Preheat oven to 180 degrees / 160 degrees fan-forced. Line a muffin tray with paper liners and set aside. Thermomix instructions - add the wet ingredients into the bowl and mix for 5 secs / SP 4. Add the dry ingredients and mix for 5 secs / Sp 4, scraping down the bowl if needed. Add the 1/2 cup chocolate chips and mix for 4 secs / SP 3 / Reverse. No thermomix? Combine the wet ingredients in a small bowl. Combine the dry ingredients in a large bowl. Pour the wet into the dry and mix until just combined. Spoon the mixture into the prepared tray and sprinkle the extra chocolate chips over the top. Bake for 12-15 minutes or until the top springs back and they are evenly golden brown. Makes 10-12 depending on the size of your muffin tray. Well love it or loathe it, today is Valentine's Day! We don't really celebrate it as such but do tend to have something a bit more special for dinner and I will often bake something chocolate-y for us all to enjoy. This year, being determined to keep some treats in the freezer at all times for school lunches and afternoon tea, I decided to just make a batch of chocolate bliss balls. 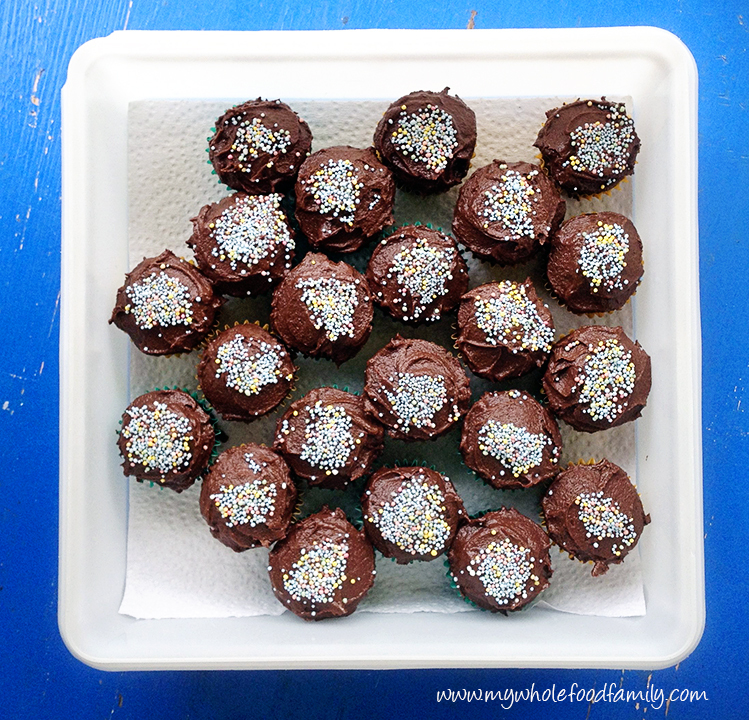 Yep another bliss ball recipe. I love them! They really are perfect little morsels of deliciousness. Our school doesn't have any nut restrictions so I don't really need to make things nut free but I think it's good to mix things up a bit so we're not eating the same things all the time. I tend to avoid dates as they are so high in fructose but as a treat now and then (and especially on Valentine's Day) I'm not going to worry about it, especially as they are also a great source of fibre and oh yeah, they're delicious! The only reason these are coconut free is that we were almost completely out of coconut! Totally unheard of in this house as there is usually coconut in all forms - coconut milk, coconut cream, coconut oil, coconut water, shredded coconut and desiccated coconut #coconutaddict. So whether you are celebrating Valentine's Day or not, I hope you had a wonderful day! Place all ingredients into a food processor and blend until the mixture is sticky and clumping together (TMX 10 secs / SP 8). Using wet hands, roll the mixture into balls and store in the fridge or freezer. So ice cream without dairy can be a little tricky, it can swing between too icy or too coconutty (totally a word) pretty quickly. But as 3 out of 5 of us are dairy free I've done a lot of experimenting. You're welcome. My kids claimed this was the best chocolate ice cream ever and their chocolate covered faces spoke volumes. It was smooth and luscious and intensely chocolatey. The perfect antidote to a hot summer's day. Make this. It's really good. TMX - place all ingredients in mixing bowl and cook 9 minutes / 90 degrees / SP 4. Don't have a thermomix? Warm the milks in a large saucepan over medium heat and bring it to a simmer. Meanwhile in a medium heatproof bowl, beat together all remaining ingredients. Pour the warmed milks into the other ingredients whisking continuously. Tip the mixture back into the saucepan and stir over medium heat with a wooden spoon until it thickens and coats the back of the spoon, 5-10 minutes. Pour the custard into a heatproof bowl and cool to room temperature before placing into the fridge and leaving to chill for at least 4 hours. Make sure you press some baking paper over the surface of the custard to stop it drying out. Once the custard is completely cold, pour into your ice cream maker and churn for approximately 15 minutes or according to the manufacturer's instructions. It will be soft-serve consistency at this stage so pop it in a glass container in the freezer for a few hours before serving (if you can wait that long). Snacks, snacks snacks! That's what we seem be needing a lot of lately. I guess moving really does work up an appetite! And today is moving day! As you read this the truck will already be here loading our things and getting us ready to start our new family life in our new home. For anyone who grew up in Australia you will be very familiar with the chocolate crackle, which featured at every birthday party and school fete as a kid. These are a far healthier version from the Naughty Naturopath Mum who calls them anti-LCM bars. I have to admit my kids have never eaten an LCM and would have no idea what they are (yay!) so I just called it a chocolate rice bubble slice for them. We don't usually buy rice bubbles either but half a bag came home with them from their sleepover down the coast in the holidays and frugal me didn't want to throw them, but also didn't want them to just eat it for breakfast because they would be starving again in 5 minutes. These were SOOOO delicious. 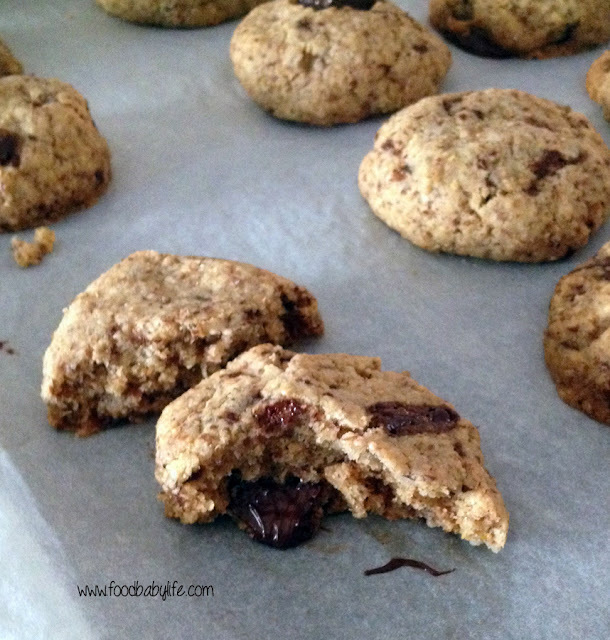 Chocolatey, caramelly, crispy and chewy and just plain good. Still a treat but one you can definitely feel good about. Grease and line a slice pan with baking paper. Place all dry ingredients into a large bowl and mix together. In a small pan over medium heat, place the rice malt syrup and coconut oil and warm gently until it is smooth and only just starting to bubble. Pour immediately over the dry ingredients and mix until well combined. Tip the mixture into the prepared pan and press down well, smoothing the top as you go. Store in the fridge and slice into bars when ready to serve (you can't store this out of the fridge as the coconut oil will start to melt as it warms up). Well the house is officially ours!!! We picked up the keys this afternoon and the boys were thrilled with the big yellow bow tied on the front door. So now it all begins in earnest. We have trades booked to start sanding and polishing the floors upstairs first thing in the morning as well as measuring the stairs for new carpet. So much to do and so little time! Moving day is Monday 14th so we are officially on a countdown now. I knew this afternoon would be a whirlwind so I took the time this morning to make something easy and delicious for afternoon tea. These are easily the best cookies I've made for ages. The rice flour gives them a little shortbready crunch and the big chunks of chocolate are a great surprise. SO tasty and they were mixed, baked and ready to eat within 30 minutes. I guarantee you'll have happy little campers if you make these for afternoon tea!! Mix all ingredients together in a large bowl. 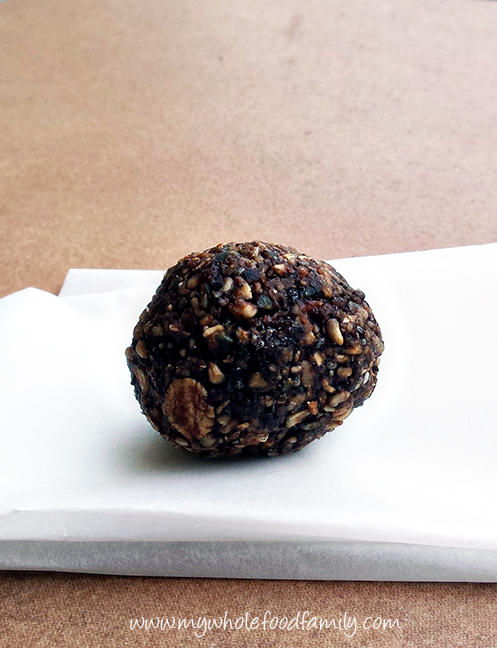 Roll into walnut-sized balls and place on the prepared tray. TMX - place all ingredients except chocolate in mixing bowl and mix for 10 secs / SP 4. Add the chocolate and mix on reverse / 6 secs / SP 3. Bake for 10-12 minutes. They will still be soft but will firm up once they cool to become crunchy around the edges and chewy in the middle, just the way I like them! Actually that should read happy birthday to us as my husband and I are lucky enough to share the same birthday! Being Sunday we had to get up early to get the kids to swimming for 8am and also do some more packing and cleaning in preparation for our move. But after lunch we got to relax a little and we had family over for birthday cake for afternoon tea and Indian takeaway for dinner (I refuse to cook dinner on my birthday!). Now some people might think it's a bit sad having to make your own birthday cake but as a baker I really enjoy it and bonus, I know exactly what's in it and can tweak the recipe to suit our needs. 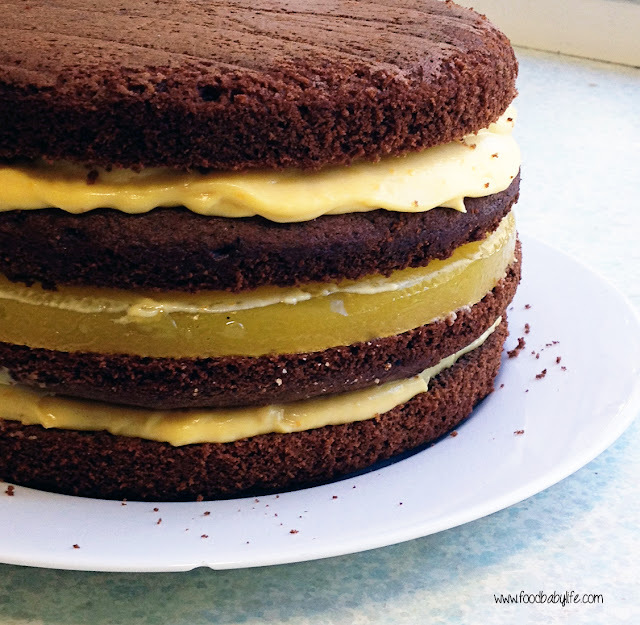 Chocolate and orange is one of my all time favourite combinations and after much (much, much) thought I decided to make a chocolate cake, sweet orange curd, orange jelly and a chocolate swiss meringue buttercream. Wow it sounds decadent when you write it out like that! We are mostly sugar-free (fructose-free) in this house and while I wanted this cake to be special I didn't want to go overboard on the sugar. My sweeteners of choice these days are rice malt syrup (which although processed is fructose-free and a great alternative to honey and golden syrup) and coconut sugar (which does contain fructose but is unrefined). I also wanted to use spelt rather than wheat flour and no dairy other than the grassfed butter we use everyday. I made a few small changes to the recipes I found and was really happy with the result. Everyone loved the cake and it was certainly impressively tall! It had all the flavour I was hoping for and it wasn't too sweet. I popped the cake in the fridge for an hour or so which was a mistake as it seemed to dry the cake out a little (I know it was really moist before that as I got to eat the trimmings - cook's privilege!). It would be much better to simply assemble the cake as close as possible to serving and leave it at room temperature until ready. 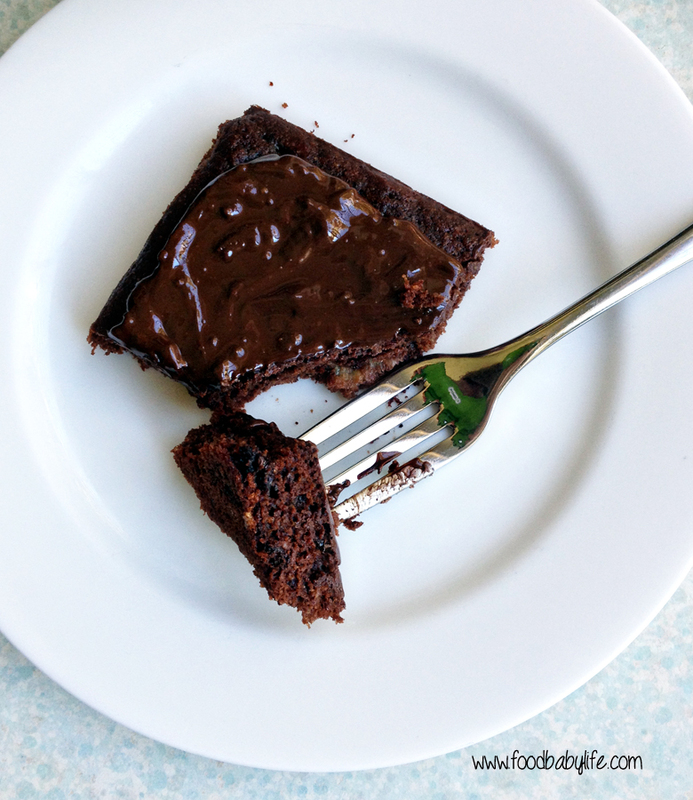 I especially loved this cake and it will become my go-to spelt chocolate cake from now on! Preheat the oven to 170 degrees celsius fan-forced. Grease and line the bases of 2 x 8 inch round baking pans. Using a stand mixer, thermomix or electric beaters, beat together the butter and coconut sugar until light and fluffy. Add the eggs one at a time, beating well after each addition, then beat in the vanilla. Sift together the flour, cacao and baking powder then add to the butter mixture, alternating with the milk until the mixture is smooth and well combined. Divide the batter evenly into the prepared pans and bake for 25-35 minutes. The cakes will have pulled away from the sides a little, spring back in the middle and a skewer inserted into the middle will come out clean (mine took 31 minutes). Leave in the pans to cool for 10 minutes before turning out to cool completely on a wire rack. Place butter into the thermomix bowl and chop 5 seconds / SP 5. Add all remaining ingredients and cook for 10 minutes / 80 degrees / SP 5. Cook for a further 3 minutes / 90 degrees / SP 6. Pour into sterilised glass jars. Place in the fridge once cooled. Grease and line the base of an 8 inch round cake pan. Place the orange juice into a small pot over low heat. Once the juice is just warm to touch, turn off the heat and sprinkle over the gelatin, whisking continuously until it is completely dissolved and there are no lumps. Pour immediately into the prepared pan and refrigerate until needed. Make sure the thermomix bowl is completely clean, dry and free of grease. Weigh in the coconut sugar and mill for 1 minute / SP 9. Weigh in the egg whites and salt and mix for 3 minutes / 60 degrees / SP 3. Check that the sugar has dissolved by rubbing a small amount of the mixture between your thumb and finger. It should be completely smooth. If not, repeat for another minute or so. Insert the butterfly and whip for 10 minutes / SP 4 until the bowl is only slightly warm and the mixture is glossy and has double in volume. With the machine running on SP 3 for 6-8 minutes, add the butter a few pieces at a time. Once it is all incorporated, pour in the melted and cooled chocolate and whip until light and fluffy. Use immediately or keep in the fridge until required (bring back to room temperature and re-whip with the butterfly on SP 4. Choose your favourite large cake plate or stand and place a small dollop of the buttercream in the middle to secure the cake. Trim the tops from each cake if they have domed and then slice each cake evenly in half horizontally so you have 4 layers. Place one half down on the plate and top with 1/3 of the orange curd. Spread evenly to the edges. Top with another cake half and press down lightly. Smooth over a tablespoon of curd and then carefully place on the prepared jelly. Top with another tablespoon of curd and another layer of cake. Repeat with another cake layer and 1/3 orange curd. Cover top and sides of cake with buttercream icing. Best assembled close to serving and kept at room temperature until ready. So there you go!! A marathon recipe but none of the components are too tricky and best of all, I was able to keep it free of wheat and refined sugar! Secret Recipe Club reveal day seems to have come around very quickly this month, which is a bit of a worry because that means it is exactly 3 weeks today until we move and there is SO much still to do! Luckily Lynn from my assigned blog for this month Turnips 2 Tangerines has provided lots of inspiration for snacks to keep us going amidst all the boxes and associated clutter. I was excited to learn that Lynn is from Wisconsin as that is where I spent a very happy semester finishing my law degree at Marquette University in Milwaukee. I have so many great food memories from my time there including buttery chargrilled corn at Summerfest, visiting Bella's Fat Cat for frozen custard and enjoying brats on the grill at a 4th of July picnic (oh and the brats MUST be cooked in beer first before being grilled for best results). 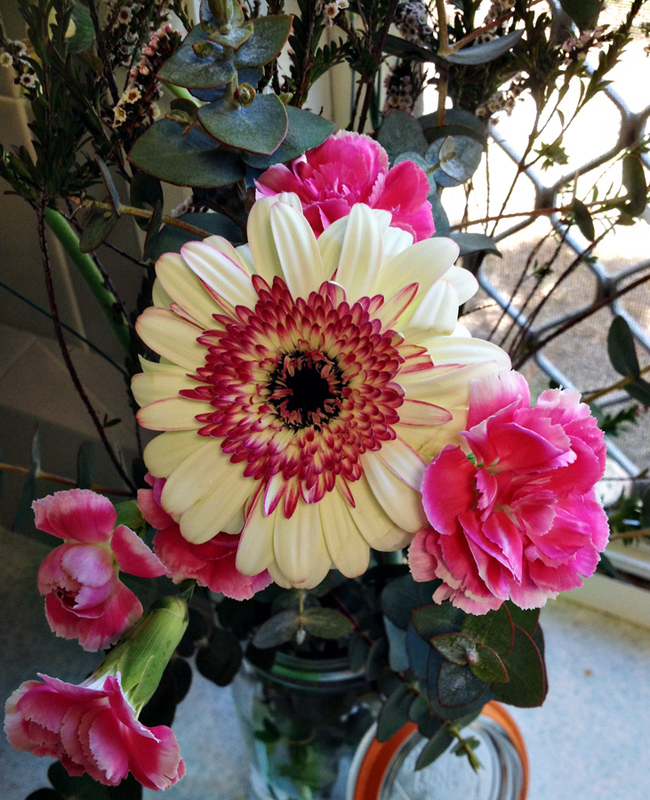 I spent ages on Lynn's blog and lots of recipes caught my eye. Lynn's Chicago Style Hot Dog looked just like what I remember but unfortunately we can't get any of those authentic ingredients here in Australia. I also drooled over her Popcorn and Peanut Mix which my boys would love and these Gingerbread Scones with Maple Syrup Glaze sound amazing and very Christmassy. But if you have spent any time here you will know we love bananas and peanut butter so when I came across Lynn's Banana Brownies with Chocolate Peanut Butter Glaze the search was over. Now I was in Wisconsin during summer and it was gorgeous but in her post for these brownies Lynn mentions the high for the day was going to be -5. That's -20 degrees Celsius and so cold I can't even imagine it! Where I live it is considered freezing if the maximum doesn't go above about 15. You really can't go wrong with a combination of chocolate, banana and peanut butter and these brownies don't disappoint. Moist and sweet and completely moreish, my boys devoured these and they were all gone in a day. Perfect for afternoon tea with a big glass of milk. We only had medium peanut butter so my glaze wasn't smooth but the little bit of extra crunch just added to the deliciousness. Preheat the oven to 170 degrees Celsius. Grease and line a 11 x 7 baking pan and set aside. In large bowl combine the flour, sugar, cacao, baking powder and salt. In a medium bowl, mix together the butter, eggs, mashed banana and vanilla. Add the flour mixture and fold through. Stir in the chocolate. Pour into the prepared pan and bake for 20-25 minutes. Do not over bake. Once cooled, pour over the glaze. In a small pan over low heat, combine the chocolate, syrup and peanut butter. Stir until smooth and immediately pour over the brownies and smooth the top. Thanks for a great recipe Lynn, it has become a family favourite! !